A heat advisory and excessive heat warning have been issued for San Diego County as firefighters are on alert for the potential of dry lightning in the mountains. Muggy weather brings the chance for afternoon thunderstorms in the mountain areas of San Diego County. In addition, a heat advisory has been issued for Friday with temperatures reaching triple digits in Ramona, Escondido El Cajon and Alpine. Strengthening high pressure above the desert will bring hot weather inland Friday and Saturday, the National Weather Service forecasts. 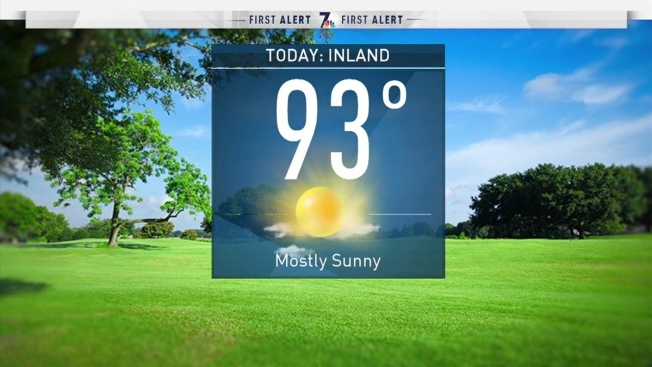 For Thursday, temperatures will be in the high 70s along the coast and mid-80s inland. An excessive heat warning is in effect this weekend for San Diego County, according to the National Weather Service. The warning was issued beginning at 11 a.m. Friday to 9 p.m. Saturday. Temperatures in the Inland Empire could reach 105 to 110 degrees with Palm Springs expected to see 119 degrees on Saturday. A warning like this means heat illnesses are likely if preventative measures are not taken. Drink plenty of fluids, stay in an air-conditioned room or stay out of the sun and check on relatives and neighbors. The Cleveland National Forest has announced it will close Three Sisters and Cedar Creek Falls for public and rescuer safety.